They were named for this brother, friend and wife, respectively. The enormous stones comprise some of Herod's most impressive and important fortifications. Only this part of the walls remained intact after the distruction of Jerusalem by the Romans. The Citadel is an extensive Medieval fortrees, now consisting of several towers connected and enclosed by strong walls, and surrounded by a moat, parts of which are now filled up. On the western side of the Old City Jerusalem the massive structure of the David Citadel looms large and overpowering. With its massive ramparts, its picturesque moat and glacis, its impregnable towers and crenellated walls, the citadel is one of the most striking monuments in the whole city. Citadel (David's Tower). The Citadel, David Tower, David Citadel Jerusalem stands on the site where Herod built his palace at the end of the first Century B.C. Our all knowledge of the buildings which anciently occupied this locality is derived from the history of Josephus, who wrote in the first century A.D., and had personal knowledge of them. He narrates that Herod the Great built (about 25 B.C. ), a magnificent fortified places here, with fine gardens, extending over a large area. He specially mentions the three massive and lofty towers which Herod built and called Phassaelus, Hoppicus and Mariamme. The famous citadel of Jerusalem containing important archeological finds and a popular venue for beautiful events and sound and light performances. One of the most prestigious museums of Jerusalem. The stones of the Tower of David Museum, located near Jerusalem's Jaffa Gate, are a part of the ancient city's living history. The Citadel, Tower of David, of Jerusalem (near Jaffa Gate) is in its present state the work of Crusaders and Mamelukes, who incorporated in it Ruins of the heavily fortified Palace of Herod the Great. It is now called "david's Tower". The Tower of Phasael, just inside the Jaffa Gate, is a Jerusalem landmark to this day. From the roof of this tower there is a wonderful view of the Old City. Flights of steps lead to the walkway which runs round the top of the Old City walls. This rampart walk has been divided into four routs, and each one provides a breathtaking view of the Old City of Jerusalem. 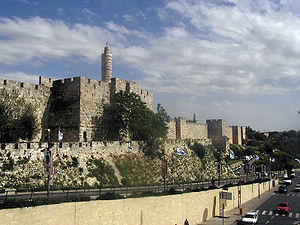 The refurbished halls now house the Tower of David Museum, which traces the history of Jerusalem over 3,000 years, using audio-visual programmes and modern exhibits. During the summer a Sound and Light show entitled "A stone in David's Tower" unfolds the dramatic story of Jerusalem in the courtyard of the museum. If we include the under-period, down through the Roman and other occupations. The most magnificent feature of the wall of Herod the Great was the three-towered structure which stood near the present Jaffa Gate. After Herod's death, when Jerusalem came under the Roman Procurators of the sub-province, Herod's palace became their residence when they were in Jerusalem, Caesarea was their capital. The citadel was called the Tower of the Pisans by the Crusaders. In its present form, it dates chiefly from the early 14th century, and is a good example of the architecture of fortresses of the period. The picturesque minaret at the northwest corner is connected with a mosque from the Moslem period.